Human Tells His Puppy To Stop Talking Back. The Pup Proceeds To Throw The Most Hysterical Tantrum. Dogs share a lot of things in common with people and its easy to see why they are considered man’s best friend. Both humans and dogs love to eat, sleep, relax, cuddle, play, have fun, and the list goes on and on. One particular shared trait that’s often overlooked is how talkative and chatty some people and their canine counterparts can be! Many pet owners have held long, interesting conversations with their dogs as if they were fellow human beings at some point in time. After all, they are a major part of the family and sometimes it just happens. When we talk to our pets it’s a very natural, normal, and possibly even instinctual way to communicate and bond with them. In fact, it goes both ways as lots of pets will often initiate conversations rather than just talk back. An AP-Petside survey from 2008 found that 67% of pet owners claim they understand their animals meows, barks, purrs, and all of the various other sounds they make. In addition, out of those surveyed, 62% reported that when they speak their animals seem to understand and get the message. 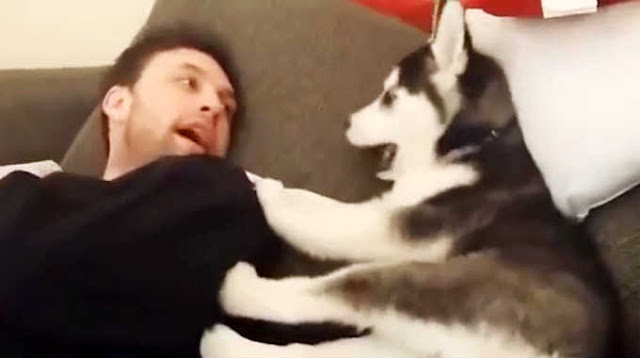 Which leads us to this short and sweet video of a Husky puppy named Sky arguing playfully with her friend, Aaron Dissell, a musician and artist. The camera is trained on the cute black and white puppy who was sprawled out comfortably next to Aaron on a couch. As you can see, like most Huskies, she is very vocal and extremely friendly. The pair were going back and forth arguing over silly nonsense and it looked like Sky was beginning to get really riled up! She barked and yapped back in response to Aaron’s chatter while gently pawing and nipping at him every so often. As the conversation went on, it became clear that Sky wanted to have the last word. Every time that Aaron said something she’d bark right back at him. It was like she was telling him she was the boss, or the alpha dog in this house, and he needed to get in line! But Aaron didn’t back down from Sky’s challenge for dominance and in the end the puppy did the cutest thing to effectively end their strange little argument. Sky either grew bored with the chat or was distracted by her leg, but whatever it was, she ended up putting her foot in her mouth! In a move only an adorable animal could pull off, she started gnawing on her foot and all Aaron could do was look on in satisfaction. He interpreted the bold move in human terms, as putting one’s foot in one’s mouth means to say something dumb that you instantly regret. Yet Sky looks like she regrets nothing and just wants to chew on something!